Thank you for visiting the website of Walnut Grove Cemetery in Bluefield, West Virginia. This site is a resource for anyone with relatives or friends buried at Walnut Grove and for anyone who would like to support the Walnut Grove Trustees’ efforts at preserving the sentimental, historical, and civic heritage of this cemetery. 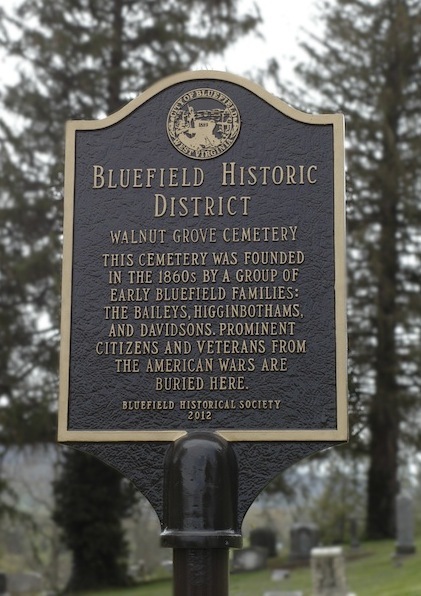 Walnut Grove Cemetery was begun in the 1860s by a group of early Bluefield families: the Baileys, Higginbothams, and Davidsons. Today it is operated by a group of Trustees who are dedicated to its preservation and upkeep. It is accessed by Hancock Street or North Street, and located in between College Avenue and North Street. Walnut Grove Cemetery was begun in the 1860s by a group of early Bluefield families: the Baileys, Higginbothams, and Davidsons. Today it is operated by a group of Trustees who are dedicated to its preservation and upkeep. Current Trustees are Roy Pruett, Steve Bourne Jr., and Carrie Frederick Frost. Walnut Grove is accessed by Hancock Street or North Street, and located in between College Avenue and North Street. Please contact the First Century Trust Department with any questions or comments about Walnut Grove Cemetery: (304) 324-3234 or Contact a Trustee. All burial and grave information on this site is believed to be true, but has been compiled from many sources and may contain errors. Please contact the Head Trustee with corrections or updates to the information you see here, or to be included on the Walnut Grove postal mailing list. A historical marker was donated by the Bluefield Historical Society and installed by the City of Bluefield in early 2013. The Trustees and supporters of Walnut Grove are appreciative of this helpful and attractive addition to the cemetery.